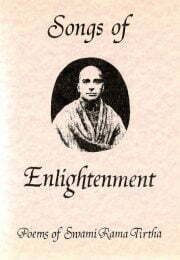 Songs of Enlightenment is a collection of poems by Swami Rama Tirtha, originally written in Persian and Urdu, here translated into English. Rama Tirtha lived 1873-1906. He attained Self-realization and left behind vivid accounts of his experience in the form of articles, poems and lectures. In his early life he overcame extreme poverty to excel in the study of mathematics, which he later taught. He also studied Persian, Urdu and Sanskrit, and the highest mystical and philosophical literature in those languages. His breadth of learning gives his writings much appeal and relevance. He taught and exemplified the idea that true Vedanta expresses itself not as indifference and inaction, but in the highest possible forms of creativity. Towards the end of his life he lived as a traditional renunciate, for extended periods in remote Himalayan regions, still producing articles and poems. Swami Rama emphasises that the key to illumination is letting go of attachment to the limited ego and affirmation of identity with the transcendental Whole. Further, he teaches that wherever there is success and progress in any field, it is due to overcoming narrowness and recognising something greater. This, he taught, is the real meaning of renunciation, and is the root of all true knowledge and happiness. This principle can be seen at work in science, engineering, art, mysticism and successful living everywhere, he says. The poems, and poetic prose, that he wrote in Urdu and Persian, are thought to contain some of his most compelling teachings, but have been relatively inaccessible to speakers of other languages, and some of these are presented in English translation here. The book also contains a considered account Swami Rama’s life and some explanatory notes. These may be usefully studied alongside the life and teachings presented in ‘Scientist and Mahatma‘. The contents of Songs of Enlightenment can be read for their poetic qualities and as statements of the non-dual philosophy in its practical manifestations. Then I am doing so by looking at you. For dedicated, practicing seekers, Songs of Enlightenment may provide valuable refreshment and recreation, and also profound teachings, if, like Rama himself, we reflect carefully on how the principles of non-duality are to be applied and expressed in our own circumstances.